are ready to transform your life! If you have SVT you are in the right place! 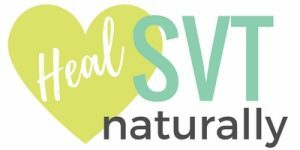 Heal SVT naturally is a website and resource for people with accelerated heart issues, especially Supra ventricular Tachycardia and related anxiety. This site discusses natural and alternative approach’s to reduce SVT episodes, reduce related anxiety, heal the root issues that contribute to symptoms & share preventative ways to elevate your overall health. In addition to the traditional treatment options like medication and ablation, there are many other things that you can do in addition to, or instead of those options, to help reduce SVT and related symptoms. If you are suffering, there is hope. I help people realize that there is much more to SVT than it being something that you fear and that negatively effects your life. Your SVT is guiding you to make lifestyle changes that will improve the quality of your overall health and your life. I hope to help you make those important connections and inspire you to live the very best life you can! Get my Top Ten Tips to Heal SVT naturally! 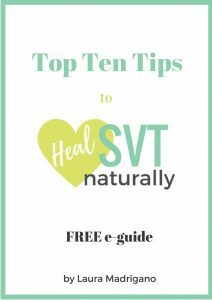 Sign up for my TOP TEN TIPS to HEAL SVT naturally! When you do you will also gain access to the private FB group and receive my weekly SVT newsletter! 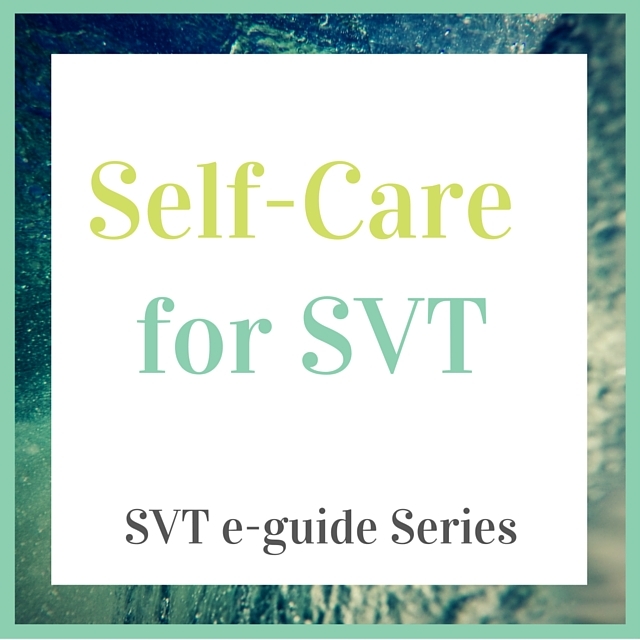 This FREE e-guide has my top ten tips for you to start doing immediately to help your SVT and elevate your overall health. As an Integrative Nutrition Health Coach and Board Certified Life Coach, I coach people with SVT from all over the world. Together we will identify your SVT triggers, give you self-care and preventative techniques that work and get you on the path to healing your SVT naturally! The food you are eating has everything to do with your SVT. 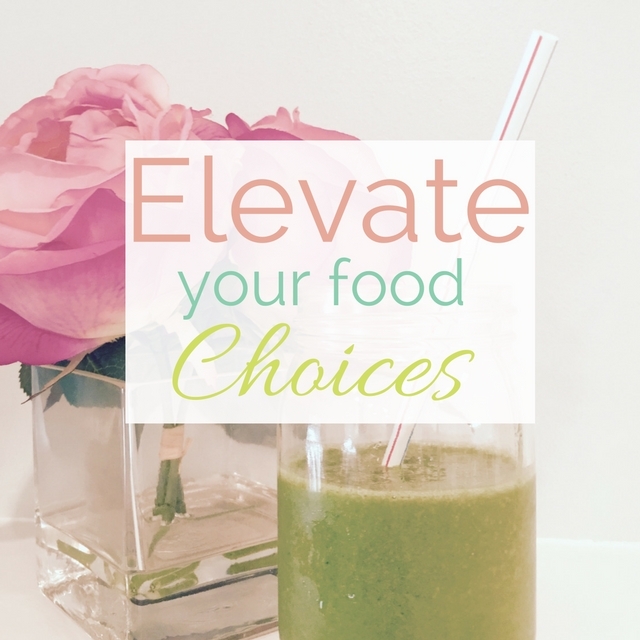 I will help you identify SVT triggers, reveal un-diagnosed food allergies, connect the dots between food, your digestion and SVT, take the right supplements, shift your diet, and address emotional eating if that applies. You are what you eat, this is the most important relationship of your life. I will help you get the support you need! I have created a private SVT Facebook Group. Join us there for support, healing methods, live chats, and more! 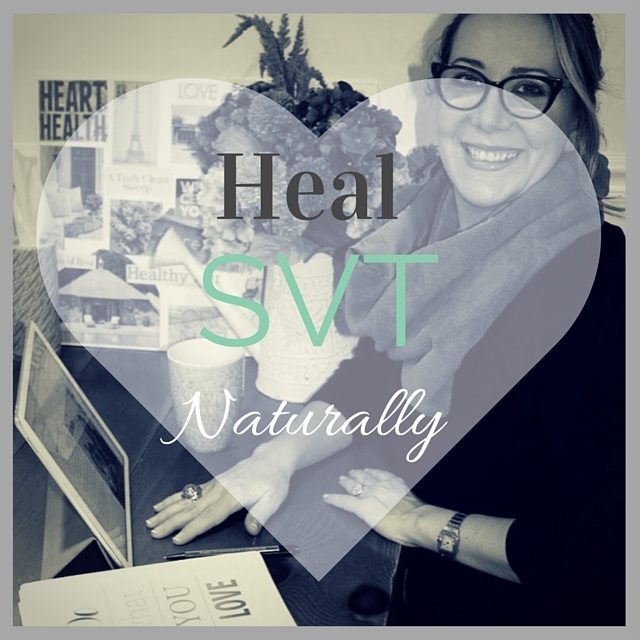 Gain access when you sign up for the Heal SVT naturally email list below! Your heart is speaking to you everyday . When we don’t listen or can’t hear it, it tries harder to get our attention. One of the louder ways that your heart is speaking to you is through SVT. Self-care is one of the cornerstones for preventing SVT episodes and improving the quality of your entire life. This 21 page e-guide will help you elevate your self-care and give you practical and realistic ways to incorporate it into your daily routine. I also share my own intimate struggle with self-care and how I overcame self-sabotaging behaviors allowing me to finally embrace my own self-care and now lead others to do the same. The guide includes, healing exercises, affirmations, guided journaling exercises, and plenty of inspiration to help you on your self-care journey! Available for immediate download. SVT or Supra Ventricular Tachycardia is an is an abnormal fast heart rhythm. It generally begins with an electrical misfire and is considered an “electrical” issue, not a “plumbing” one. SVT can be confused with anxiety or panic attacks because one can trigger the other. What is an SVT Coach? 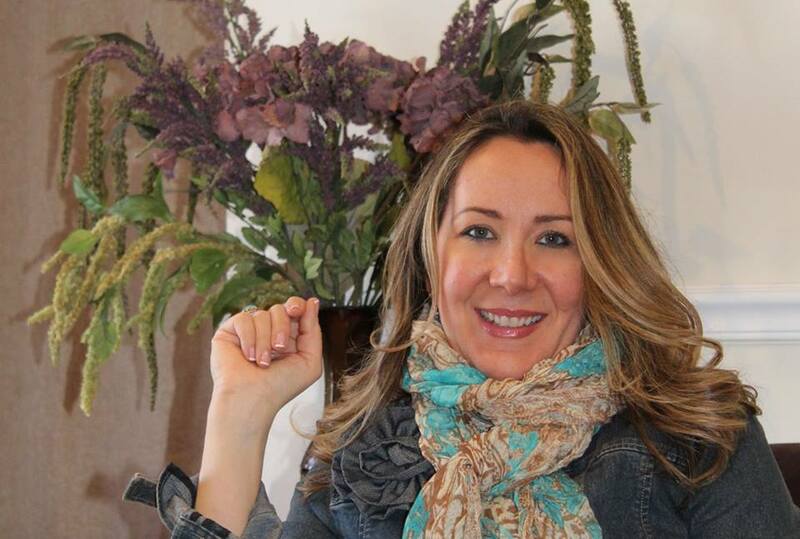 As a Board Certified Life Coach, Integrative Nutrition Health Coach, and fellow SVT sufferer and thriver, I offer a very unique blend of expertise. I help fellow SVT sufferers learn about all the ways that they can support their health, prevent SVT and listen to heart and its messages! I help people by empowering them to look at the Physical, Emotional Spiritual & Energetic layers to SVT. Healing your SVT is about prevention, and like so many other health issues, we now understand the best way is to take a whole body approach. I want to help empower you! Being IN ACTION helps reduce anxiety and is the first step to taking back control of your life. 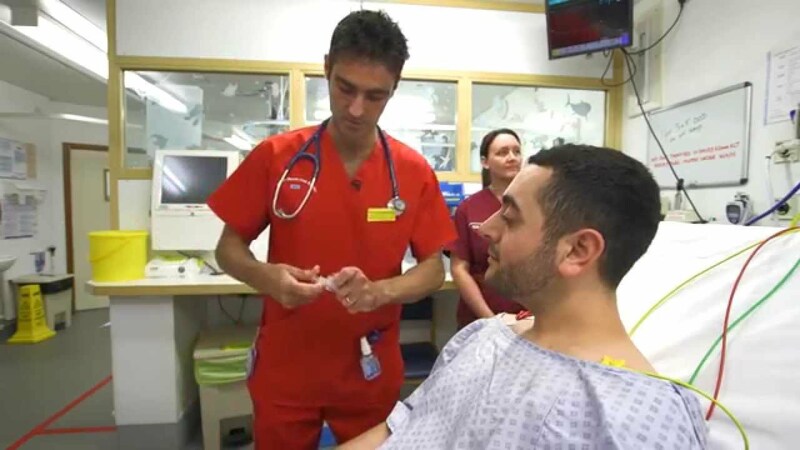 Learn exactly WHY you are having SVT and what you can do about it on every level. YOU deserve to feel better now. You need someone who is your health advocate listening to every single need, I want to help you. I am your SVT coach! Are you ready to stop surviving and start THRIVING? You have ONE life to LIVE…. Are you ready to make it the very best you can? Together we will look at the physical layers of your Accelerated Heart episodes. 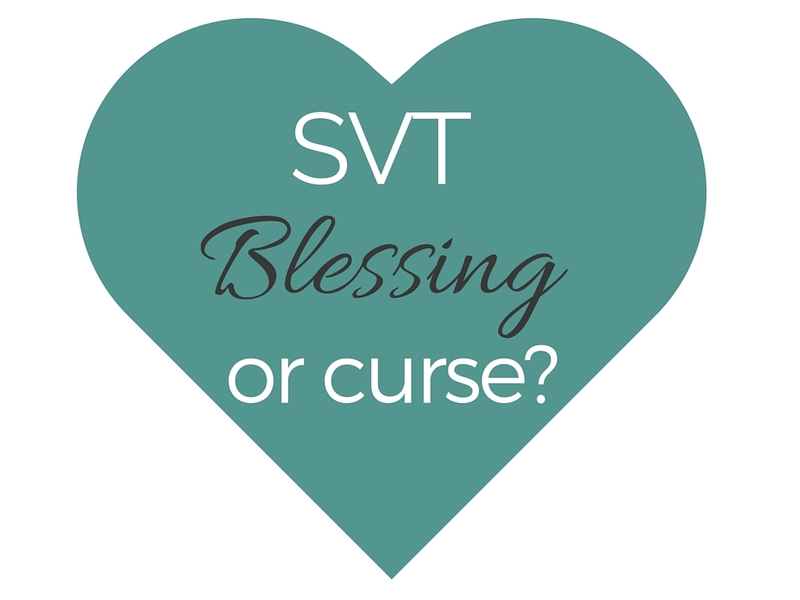 Your Food & Lifestyle Choices, Cravings, Diet, Eating Habits, Water Intake, Supplements, Sleep Patterns, Emotional Eating and other crucial things that all effect your SVT. The emotional layers to SVT are rooted in stress, fear, anxiety, old stuck emotions, sacred wounds from your past, anger, self-value and your ability and desire to self-nourish. Together I will help you clear what no longer serves you, dis-entangle from default energetic patterns and help you align your heart messages, service and joy. Your Heart is your Spiritual Center. Your heart speaks to you and through you. I help people with the Spiritual Layer to SVT by addressing the heart as the center of how you build your life. Great Video on converting a SVT. If you don’t know about this method yet, it is super effective and you must learn it!! View this video on the blog below.